Decent pub with a deceptively large beer garden to while away the hours in the sunshine. Unfortunately we only had time to stay for one but I could've easily stayed longer. Didn't have food but it looked good as it went past to other tables. Also, the main bar looked loke a proper pub bar, so although they may have a focus on food - and who can blame them - there were plenty of people sitting around just having a light ale when we were there. I liked the atmosphere in there, relaxed, but helpful and friendly staff. Gets a decent 7/10 from me. 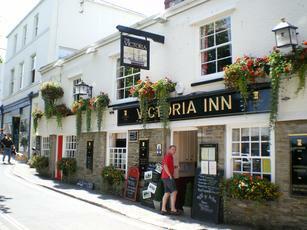 Decent seaside ye olde type pub, st Austell ales only, so ale choice a bit tiring. 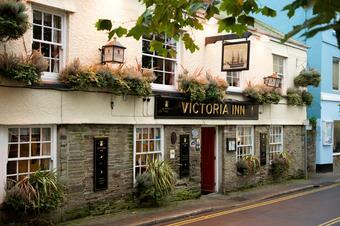 Busy and food focused and so behind the pub like style lies a restaurant. For a quite pint with an ale choice to elsewhere, for a friendly restaurant with some pub charm enter. 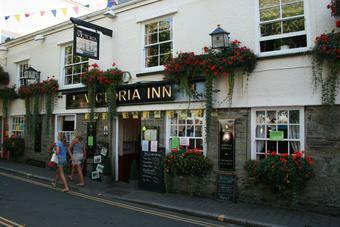 An attractive pub in the heart of Salcombe, it offers extensive, terraced gardens and a pleasant ambience although there does seem to be quite an emphasis on food to the detriment of punters who may just want a pint. The main bar at the front has some attractive giant flagstones on the floor, mustard colour paintwork and dark red/maroon wood panelling on the lower part of the walls. There was a brick fire-place at each end, one with black painted bricks, and each containing a wood burning stove. A number of black beans on the ceiling and a couple of red leather sofa�s completed the cosy feel and there were various nautical pictures on the wall as well as other nautical artefacts such as a ship�s lantern and wheel. A small bar off to the right was perhaps slightly less food focused, but there were still a number of people eating here. There was also a separate dining room off to the left. The gardens at the back are on three levels and extend back a considerable distance, much further than would be expected from looking at the front of the pub and the topmost level offers glimpses of the sea. There is also a kid�s climbing frame. The menu was extensive and most of the mains were priced at around the �10 - �12 mark. There was also a fish specials board. We had Beer battered cod with chips, minted mushy peas and homemade tartare sauce and a Double baked pork belly, both of which were very good. Staff were helpful and friendly. Beers on tap were all from St. Austell�s, with their Trelawney, Proper Job, Tribute and Dartmoor Best. Ciders were Strongbow and Cornish Rattler, along with a couple of other Rattler derivatives such as pear and berry. Cosey pub with an open fire and a good selection of ales. St Austell Tribute and Proper Job were both excellent. Good food and friendly bar staff. Wednesday night quiz was a bonus. Very nice pub with a lovely beer garden. Only critism is today when the 'specials' board was offered i had to comment to the waitress that there was no vegetarian selection available and said she should tell the chef to look at this. I see there was only two vegetarian options besides a sandwich on the main menu.